PT United Tractors Tbk - UT or referred to as "United Tractors" is a large and solid public-listed company in Indonesia that deals with heavy equipment and mining industry. United Tractors concentrates its business activities in heavy equipment distribution, mining contracting and coal mining. PT United Tractors Tbk is a subsidiary of large business conglomerates, Astra Group (PT Astra International Tbk, IDX:ASII). At present, Astra Group holds 59.50% shares in this Company with the 40.50% remainder of the shares belonging to general public shareholders. 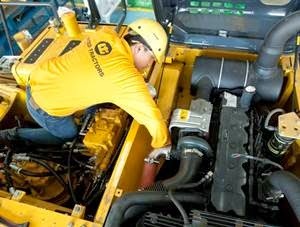 Headquartered in Jakarta, United Tractors runs its business through 19 branch offices, 22 site support offices, 11 representative offices, 14 mine offices, 39 workshops, 8 remanufacturing facilities, 117 warehouses spread all over Indonesia. PT United Tractors Tbk also supported by 12 subsidiary / affiliated companies. Achievement and performance of United Tractors in the third quarter of 2015 (3Q 2015) shows good results achievement. According to the United Tractors 3Q 2015 financial report as cited by JobsCDC.com, United Tractors was able to expand total net income by 17% from Rp 4.78 trillion in 3Q 2014 to Rp5.57 trillion in 3Q 2015 largely due to the benefit of favourable US Dollar exchange rate. Total revenue decreased 6% from Rp40.8 trillion in 3Q 2014 to Rp 38.29 trillion in 3Q 2015. University Degree (S1) with major study in any field. ge of candidate under 25 years old. Willing to be stationed in all site and branch around Indonesia. Final year students who will graduate before April 2016 are encourage to apply. University Degree (S1) with major study in Economic. University Degree (S1) with major study in Engineering. University Degree (S1) with major study in Electrical and Mechanical Engineering. JobsCDC.com now available on android device. Download now on Google Play here. Please be aware of recruitment fraud. The entire stage of this selection process is free of charge. PT United Tractors Tbk - Fresh Graduate Virtue Program Astra Group February 2016 will never ask for fees or upfront payments for any purposes during the recruitment process such as transportation and accommodation.